For years, this verse has been my hope and prayer, held in my heart, especially the last sentence about a cord of three strands being so strong. As my Viking and I prepared to wed, we did a bit of research about Nordic wedding traditions. 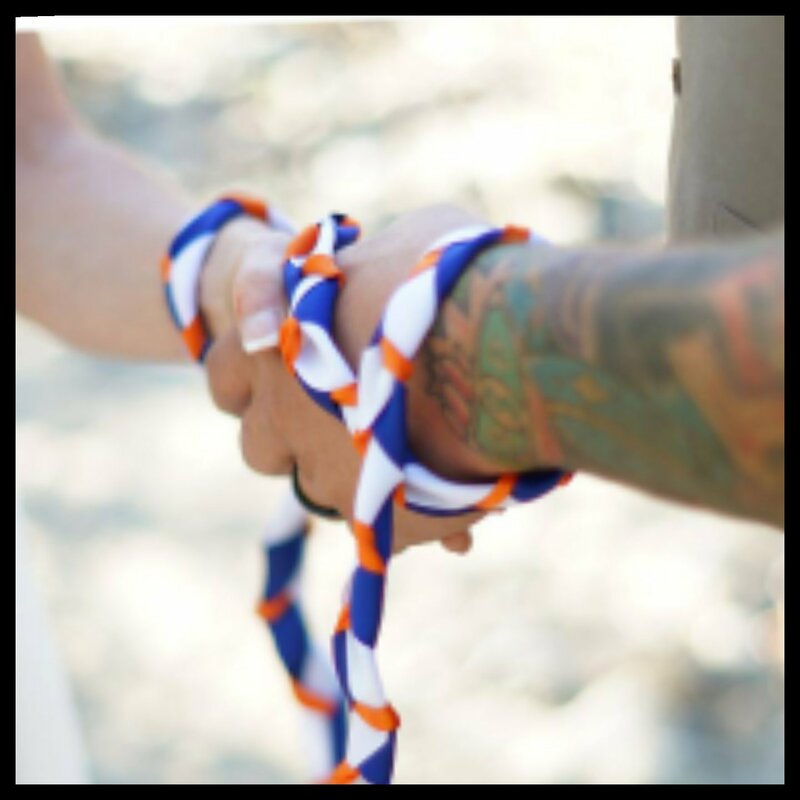 Incredibly, we found that often, in Nordic weddings, there is a hand-tying portion of the ceremony where the bride and groom’s hands are bound together in a triple-braided cord to represent the two coming together and be bound to one another with God. The visual representation of this joining together very closely matched an image that has stuck with me for a very long time. Consequently, together with our Pastor, we incorporated this tradition into our wedding ceremony. Already, as we drove home from Wenatchee yesterday, (where our wedding took place) this verse proved itself true for us. We came upon horrendous traffic, and the typical two-and-a-half hour drive turned into eight hours. On our own, either one of us would have been ready to tap out; however, with the support of one another and the grace of God, we successfully navigated our way home through the heat and traffic, unscathed and still speaking to one another. The wonderful thing about the promise held in two being better than one, is that it perpetuates our charge to be engaged in the body. If we love God and love one another, we are not alone and have the strength of that three-strand cord. May we ever invest in our relationship with God and one another so that we may stand together in His strength, no matter what comes our way. In heart and in home. Dear Heavenly Father, thank You that You created us to be in relationship with You and with each other. Thank You that when two join together and invite You to be the center, You come and intertwine Your heart with ours and grant us strength. Forgive us for the times that we attempt to take on what lies before us on our own. Teach us to trust You and those whom You have given us to walk beside. Show us how to love each other in a way that joins hearts and minds in Your purpose to walk out Your plan. May many come into a lasting relationship with You. Be glorified O God, as we stand with You as a three-strand cord, bound in Your strength, hope and love. Amen. This entry was posted in Awe, Beauty, Blessing, Community, Faith, Forgiveness, Freedom, Gentleness, Grace, Gratitude, Healing, Hope, Kindness, Love, Mercy, New, Obedience, Peace, Poetry, Possibilities, Praise, Protection, Purpose, Serve, Strength, Surrender, Trust, Voice, Worship and tagged accomplish, alone, attacked, attempt, binds us together, bride and groom, broken, center, ceremony, conquer, cord, defeated, defend themselves, designed, drove home, Ecclesiastes 4, engaged in the body, exalt His Name, falls down, forgive, found inside, given, glorified, glorify, God, good return, grace of God, greater, hand-tying, heart, heat and traffic, held in my heart, help, help the other up, His strength, home, hope, in God abide, incorporated, intertwine, invest, invite, join together, joined, joining together, joins hearts and minds, keep warm, labor, lie down together, Lord, love, love God, love one another, Loving Creator, much better, my Viking, Nordic wedding traditions, not alone, our charge, ours, overpowered, pastor, perpetuates, prayer, prepared, promise held, proved true, pulls up, ready, relationships, represent, research, results, show, stand, stand back-to-back, stand together, still speaking, strength, strong, stuck with me, successfully navigated, support, tap out, teach, three is better, three strands, together, tradition, triple-braided cord, trouble, trust, twice as much, two are better than one, unite, unscathed, visual representation, walk beside, warmth, wed, wedding ceremony, wonderful thing, Your heart, Your plan, Your purpose. Bookmark the permalink. One of the hardest times to find peace is in the midst of a trial. It is so easy to allow our fears and emotions to get the best of us, and forget Who is ultimately in control. I am quite certain that this is why God calls us to be in community. When one falls down or is struggling, facing a trial or uncertainty that lies before them, sisters and brothers who know our stories can come alongside to help and encourage, as God equips us to be His hands, heart and voice made tangible to those around us. May we reach out to love well, those in a place of need, and be transparent with the trusted, when we find ourselves in a similar space, so that the peace of God may be made perceivable to all. Your love will shine through. Dear Heavenly Father, thank You that our peace comes from You. Thank You that though we will have troubles because we live in a broken world, we can take courage knowing that You are with us. Thank You too for community, as You surround us with those who can come alongside us and encourage and lift us up if we are willing to invest. Forgive us for the times we have tried to power through the pressures on our own, rather than seeking You and sharing with those whom You have shown us are trustworthy in our world. Help us to trust You more, so that we would seek You for peace, even in the most tumultuous of trials. Help us to love those around us in a way that offers peace and strength in the midst of their struggles too. May many come into a lasting relationship with You. Be glorified O God, as we take heart in You, as You have already overcome every obstacle that stands in our way. Amen. This entry was posted in Awe, Blessing, Comfort, Community, Courage, Faith, Fear, Forgiveness, Gentleness, Grace, Gratitude, Hope, Humility, Joy, Kindness, Love, New, Obedience, Peace, Poetry, Possibilities, Praise, Purpose, Strength, Surrender, Trust, Voice, Worship and tagged allow, best of us, brave, broken world, certain, come alongside, community, conquered, control, courageous, defeated, doubt, easy, emotions, equips, experience, faced, facing a trial, fear, find, find peace, forget, forgive, give, glorified, great confidence, greed, hands, hardest times, have peace, heart, heartache, help, in me, John 16, joy, love, love well, need, obstacle, offers, overcome, perceivable, power through, pressure, promise, reach out, rest, seek, shine through, shout, show, sing, sisters and brothers, sorrows, stories, strength, struggling, take heart, tangible, taught, these things, told, transparent, trial, trouble, troubles, trusted, unbelieving, voice, world, you. Bookmark the permalink. As Easter approaches, we are reminded anew of the life, death and resurrection of Jesus. He willingly bore the agony of the cross on our behalf, so that we could be raised to new life in Him. This season is a reminder of the awakening that occurred as life was breathed into His body in the tomb. Though there are dark days, when the sun returns and the flowers bloom, we see the hope of the longer, sweeter days of summer on the horizon. In the same way, on the third day, after much darkness and despair, those closest to Jesus went to visit His body, only to discover that He was alive again! Our hope is held in the One who defeated death so that we could find life in Him forever. May we always remember that the darkness is but for a season, and His light dwells within us, holding the hope of all that is yet to come. He makes His grace plain. Grace that will not cease. Dear Heavenly Father, thank You that You willingly endured the scorn and shame of the cross, and overcame the grave to give us new life in You. Thank You that even when darkness and death seem to surround us, there is always light and life in You. Forgive us for making You too small, as You are the Overcoming King. Teach us to trust You more, so that we would rely on You in all things and at all times. Show us how to love others in such a way, that we offer hope, light and life where they fear there is none. May many come into a lasting relationship with You. Be glorified O God, as we recognize and celebrate the power held in Your presence as You alone bring hope and new life. Amen. This entry was posted in Awe, Blessing, Comfort, Community, Courage, Faith, Fear, Forgiveness, Gentleness, Grace, Gratitude, Hope, Kindness, Love, Mercy, Obedience, Offering, Peace, Poetry, Possibilities, Praise, Sacrifice, Strength, Surrender, Trust, Voice, Worship and tagged agony, alive, anew, approaches, awakening, beat, behalf, bore, breathed, cease, celebrate, closest, cross, dark days, darkness, death, defeated, despair, discover, dominate, dwells, Easter, endured, flowers bloom, forever, forgive, glorified, grace, grave, hand over, held, help, holding, hope, horizon, Jesus, kill, knows, laugh, life, light, longer, love, Matthew 20, new life, occurred, offer, One, overcame, Overcoming King, pain, paths, plain, power, presence, raised, recognize, relate, rely, reminded, reminder, resurrection, returns, same way, scorn, season, see, seek, shame, show, sun, sweeter days, teach, third day, tomb, too small, trust, ways, weight, willingly, within, yet to come. Bookmark the permalink. Walking with God does not mean that our lives will be without trouble or trial, but rather it is a promise that we will have the peace of His presence and the hope of His help, as He who is in us is far greater than anything that could come against us. Every year, this is the time that people begin to look ahead in anticipation of all that is yet to come. For many, this is a space of fearful uncertainty. Not one of us can predict all that lies ahead, but when we place our trust in Christ, we can be certain that whatever comes, we will not be in it alone. God will go before us, walk beside us, and surround us, to make certain that we know His nearness and His peace. Nothing is unexpected to Him, and He already knows the outcome before the day begins. Our help and our hope are in the Lord, and we need to trust Him to lead us each new day. May we look to the Lord to be our peace, and take heart in His goodness as we prepare to move forward into a brand new year. Dear Heavenly Father, thank You that no matter what lies ahead, we can have peace in You. Thank You that You have already overcome all that might come against us. Thank You that Your Spirit in us is far greater than all that attempts to overwhelm us. Forgive us for our fearfulness of that which is yet to come, and teach us to trust You more so that we would look fearlessly to the future. Help us to see things through Your eyes and not our own, so that the things that seem overwhelming to us, could be viewed as the simple to You. Show us how to love those around us in a way that provides peace and comfort in a seemingly chaotic world. May many come into a lasting relationship with You. Be glorified O God, as we trust You and Your peace regardless of the trials that come our way. Amen. This entry was posted in Awe, Blessing, Comfort, Community, Courage, Faith, Fear, Forgiveness, Gentleness, Grace, Gratitude, Hope, Kindness, Love, Mercy, Obedience, Peace, Poetry, Possibilities, Praise, Purpose, Strength, Surrender, Trust, Voice, Worship and tagged alone, anticipation, before, beside, brave, certain, Christ, defeated, earth, fear, fearful, forgive, forward, found, future, glorified, God, goodness, greater, heart, help, here, hope, jesus name, John 16, know, knows, lies ahead, lives, look, look ahead, Lord, love, near, nearness, outcome, overcome, overwhelm, peace, predict, presence, proclaim, promise, rise up, see, show, song, sorrows, strength, surround, take heart, teach, to come, told, trials, troubles, trust, uncertainty, walking, world, write. Bookmark the permalink. Any strength that we have to stay the course that we are called to cover, comes from Christ alone. On our own, we become distracted, deflated and defeated when opposition comes our way. With Christ, we are equipped and empowered to overcome any obstacle that arises before us, as He either removes the barriers or shows us how to navigate in spite of them. The Lord goes before us and walks beside us, to strengthen and protect every heart that is pursuing to follow the path He has placed before us. May we choose to trust He who is our Source of all security and strength, as we continue walking in the direction He has called us, knowing that He will keep our way secure. In faith, for Him wait. He’s called me to be. Come as You are known. Dear Heavenly Father, thank You that You are the One who gives us strength and keeps our way secure. Thank You that as we place our trust in You, You lead us, guide us and provide what we need to follow the course to which we are called. Forgive us for not moving the direction that You call us to move, or for not seeking Your heart for where we are meant to go. Teach us to trust You more, so that we would desire with all that we are, to know Your way and move according to Your will. Show us how to love all whom we encounter in a way that demonstrates Your goodness and grace. May many come into a lasting relationship with You. Be glorified O God, as we seek You for strength and direction, as You alone are our Source and security forever. Amen. This entry was posted in Awe, Blessing, Comfort, Community, Courage, Faith, Forgiveness, Gentleness, Grace, Gratitude, Hope, Kindness, Love, Mercy, Obedience, Peace, Poetry, Possibilities, Praise, Purpose, Strength, Surrender, Trust, Voice, Worship and tagged alone, arises, arms, barriers, before, called, choose, Christ, clears, comes, course, cover, defeated, deflated, desire, direction, distracted, empowered, encircled, equipped, follow, forever, forgive, gives, glorified, God, goodness, grace, guide, have, help, joy, keeps, known, lead, Lord, love, navigate, need, obstacles, opposition, overcome, own, path, peace, placed, protect, provide, provides, Psalm 18, pursuing, removes, secure, security, show, shows, stay the course, stay true, straight, strength, strengthen, take, teach, trust, walking, way. Bookmark the permalink.